Smartphones are called that for a reason – they are powerful enough to help us not just make phone calls but check our emails, browse the internet and much more – but the new Light Phone ditches all of this in favour of keeping it simple. Really simple. Forget skimming through Facebook or flirting on Snapchat; the Light Phone allows you to make and receive phone calls – and that's it. Not even text messaging is supported. Why would you want to buy a phone that's so bereft of features? 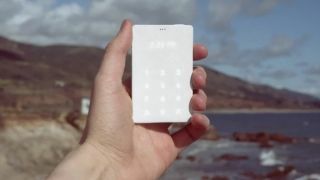 The creators behind the Light Phone, Joe Jollier and Kaiwei Tang, believe that by stripping back the features owners of the Light Phone won't be obsessed with checking it every couple of minutes, and will instead enjoy life. Will stripping back the features allow us to break free from the Stockholm syndrome-esque thrall we find ourselves in with our smartphones, and allow us to step blinking into the light? We doubt it, but it could prove to be a handy emergency phone – or one we take camping or to festivals – to let us make calls when our main phone dies. If you're interested in the Light Phone you can pledge $100 (around £64, AU$125) on its KickStarter funding page to get a handset, though as the fund raising process is still ongoing, it might be a while before you get your hands on one.